The West Cascades ecoregion extends from just east of the Cascade Mountains’ summit to the foothills of the Willamette, Umpqua, and Rogue Valleys, and spans the entire length of the state of Oregon, from the Columbia River to the California border. 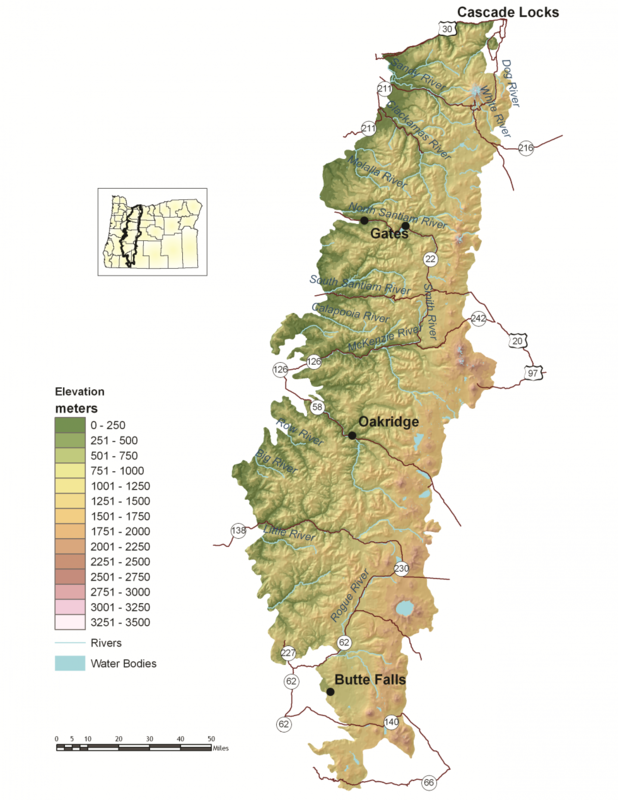 The topography and soils of the West Cascades ecoregion have been shaped dramatically by its volcanic past. Geologically, the West Cascades ecoregion has two distinct areas: the younger volcanic crest (approximately 3 million years old) and the “old Cascades” to the west of the crest (at least 30 million years old). The volcanic crest includes the highest peaks in Oregon: Mt. Hood, Mt. Jefferson, and North, Middle, and South Sisters, all more than 10,000 feet. The “old Cascades” are characterized by long, steep ridges and wide, glaciated valleys. This ecoregion is almost entirely forested by conifers, although the dominant tree species vary by elevation, site characteristics, and stand history. Douglas-fir is the most common tree below 4,000 feet, often with western hemlock as a co-dominant. At higher elevations, dominant tree species include Pacific silver fir, mountain hemlock, or subalpine fir. Other common conifers include western red cedar, grand fir, and noble fir. Above approximately 7,000 feet, the conditions are too severe for tree growth, and alpine parklands and dwarf shrubs predominate, including some wetlands and barren expanses of rock and ice. The climate and resulting fire regime vary with latitude and elevation. Fire regimes in the forests vary across the ecoregion, with the northern portion of the ecoregion seeing less frequent but more severe fires, whereas the southern portion is typically drier with frequent, lightning-caused fires. In the southern areas, ponderosa pine, sugar pine, and incense cedar often are found with Douglas-fir at the lower elevations. At the lower elevations, winter conditions are mild with high rainfall. Above 4,000 feet, much of the precipitation occurs as snowfall. The West Cascades ecoregion houses just over 1 percent of Oregon’s population, mostly in towns including Cascade Locks, Butte Falls, Detroit, Gates, Idanha, McKenzie Bridge, Blue River, Oakridge, Westfir, and part of Sweet Home (the remainder of which lies in the Willamette Valley ecoregion). Local economies were once entirely dependent on timber harvest but have been greatly affected as market conditions (long-term and broad-scale changes in the forest products marketplace) and shifts in public forest management priorities have shaped Oregon’s timber industry. Many towns are increasingly promoting recreational opportunities, including hiking, camping, fishing, hunting, birding, mountain biking, and skiing. However, timber harvest is expected to remain important to local West Cascades economies in the future. Of all of Oregon’s ecoregions, the West Cascades is considered the healthiest by several indicators. For example, this ecoregion has the highest water quality in the state, and the fewest problems with water allocation and quantity. Very few species have been extirpated from this ecoregion, and there has been considerable effort toward recovering threatened and endangered species. Much of the remnant classic late-successional forests on public land are managed with an emphasis on biodiversity under the Northwest Forest Plan. Although focused on the Northern Spotted Owl, the plan was intended to address the needs of a wide array of species affected by loss and fragmentation of late-successional forests, and covers more than 1,000 species of plants, animals, and fungi. However, the adaptive management component of the Northwest Forest Plan has not been fully implemented. Also, many forests in the West Cascades ecoregion are in Fire Regime Condition Class II, with moderate risk of losing one or more ecosystem components. Key Conservation Issues of particular concern in the West Cascades ecoregion include Disruption of Disturbance Regimes, Invasive Species, and Barriers to Animal Movement. Additionally, recreational impacts are an emerging conservation issue here. Many forests in the West Cascades ecoregion are in Fire Regime Condition Class II, with moderate risk of losing one or more ecosystem components. Efforts to reduce risks of uncharacteristically severe fires can help to restore habitat but require careful planning to provide sufficient habitat features that are important to wildlife (e.g., snags, downed logs, hiding cover). Use an integrated approach to wildfire issues that considers historical conditions, wildlife conservation, natural fire intervals, and silvicultural techniques. Encourage forest management at a broad scale to address limiting factors. Reintroduce fire where feasible; prioritize sites and applications. Maintain important wildlife habitat features, such as snags and logs, to sustain dead wood-dependent species. Monitor these efforts, and use adaptive management techniques to ensure efforts are meeting habitat restoration and wildfire prevention objectives with minimal impacts on wildlife. Non-native plant and animal invasions disrupt native communities, diminish populations of at-risk native species, and threaten the economic productivity of resource lands. Emphasize prevention, risk assessment, early detection, and quick control to prevent new invasive species from becoming fully established. Prioritize efforts to focus on key invasive species in high priority areas, particularly where Strategy Habitats and Strategy Species occur. Where needed, use multiple site-appropriate tools (e.g., mechanical, chemical, and biological) to control the most damaging invasive species. Promote the use of native species for restoration and revegetation. Passage barriers, such as dams and culverts, reduce available habitat for fish and aquatic species in the West Cascades. Continue working with Oregon Watershed Enhancement Board, Oregon Department of Transportation, Oregon Department of Forestry, USFS, BLM, counties, local municipalities, irrigation districts, and other partners to inventory, prioritize, and provide fish passage at artificial obstructions, leveraging current work done by ODFW’s Fish Passage Task Force to expand implementation of fish passage priorities. Increasing demands for year-round recreational activity, including new mountain bike trails, ski lifts, and skill parks, can disturb wildlife. Ski seasons are becoming shorter, contributing to the demand for year-round recreational activity. Plan new recreational trail systems carefully and with consideration for native wildlife and their habitats. For example, limit night riding to certain areas to minimize disturbance to wildlife, avoiding areas more sensitive to damage such as wetlands. Take advantage of abandoned or closed roads, rail lines, or previously impacted areas for conversion into trails. Work with the land management agencies such as the USFS to designate areas as high value recreation and low habitat impact areas. The West Cascades foothills once had extensive woodlands and savannas of widely-spaced, large Oregon white oak, ponderosa pine, and Douglas-fir trees with a grass and wildflower understory. Native Americans are thought to have maintained these habitats through the use of fire, which produced forage for big game, improved traveling conditions, and selected for important subsistence plants, such as camas, tarweed, and desert-parsleys. Photo Credit: U. S. Forest Service. Jim’s Creek Restoration project area. As a result of changes in fire frequency and intensity after European settlement, Douglas-fir now dominates in many of these areas, and many open woodlands and savannas converted to forests. Almost 95 percent of open oak and pine habitats have been lost in this ecoregion. Currently, remnant patches of oak-pine woodlands and savannas are found on the margins of the Willamette, Umpqua, and Rogue Valleys and some dry, south-facing mid-elevation slopes. One site with a remnant oak-pine woodland and evidence of Native American use is the area around Jim’s Creek on the Willamette National Forest near Oakridge. The site’s important ecological and cultural value inspired a comprehensive planning effort to restore some of the oak-pine habitat. Once a savanna with large, scattered oak, pine, and Douglas-fir trees, the area was transitioning into a dense Douglas-fir forest, jeopardizing the survival of the large heritage ponderosa pine trees. Several of the large ponderosa pines have scars characteristic of bark removal. Native Americans removed the inner bark (cambium) for medicine, so these large trees are considered “medicine trees”. However, the large pines were declining in health, and oaks were restricted to the margins of small, rocky openings. Pine and oak trees were not regenerating. The Willamette National Forest recognized the impending loss of this site and initiated an extensive outreach effort to the communities of Oakridge and Eugene, including political leaders, Native American leaders, the timber industry, and environmental groups to discuss the issues and ask people how they thought the landscape should be managed. Beginning in 2001, stand examinations and ecological studies of current and historical vegetation, small mammal populations, bird species composition, and fish populations were conducted to determine restoration opportunities and to guide management in an adaptive management approach. 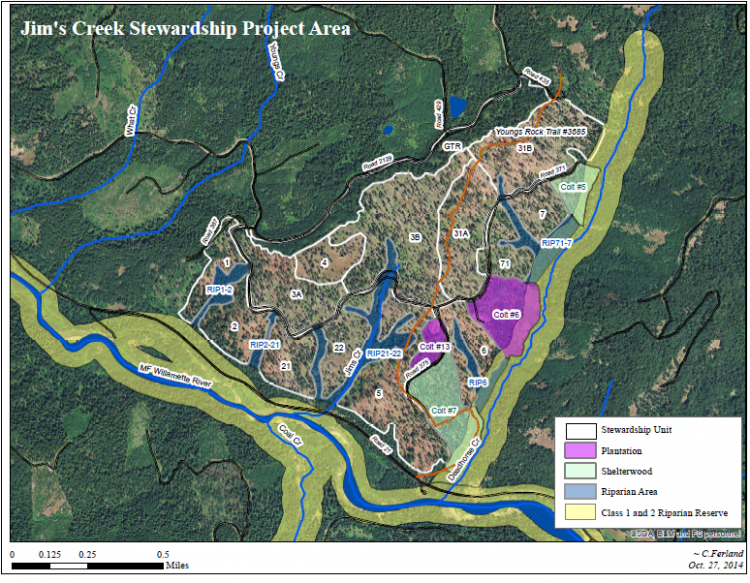 In 2007, a Stewardship Contract was awarded to restore about 455 acres in the Jim’s Creek Project Area. One aspect of the restoration was removal of most of the younger Douglas-fir that had established as a result of the altered fire regime. The timber harvest portion of the Stewardship Contract was completed in 2012 resulting in approximately $300,000 in retained receipts that were used to fund additional restoration actions including the reintroduction of prescribed fire, snag creation, and meadow restoration. The Stewardship Contract activities will be completed in 2015 but periodic maintenance, such as prescribed fire, will likely be necessary to maintain the restored savannah condition. Although restoration came too late for some pines and oaks in Jim’s Creek, most of the mature pines survived, and many remaining oaks are experiencing crown expansion. Numerous ongoing studies of the recovering savannah as well as the grass and wildflower understory will provide a valuable guide to further restoration of oak and pine savannah habitat in this ecoregion. Restoration often takes time and persistence, but the Jim’s Creek project successfully restored an important cultural and ecological landscape, in part due to the time investment in constructing comprehensive partnerships and planning science-based restoration.